About 80 students crowded into the Live Oak Pavilion early Monday morning to participate in a Day of Service, which was put on to celebrate the life of civil rights activist Martin Luther King Jr. The volunteers branched out from the Pavilion to assist multiple non-profit organizations in the local community like Boca Helping Hands, which is a food kitchen and job-training center, and Arc Broward, which helps people with disabilities. assisted multiple non-profit organizations in the local community. 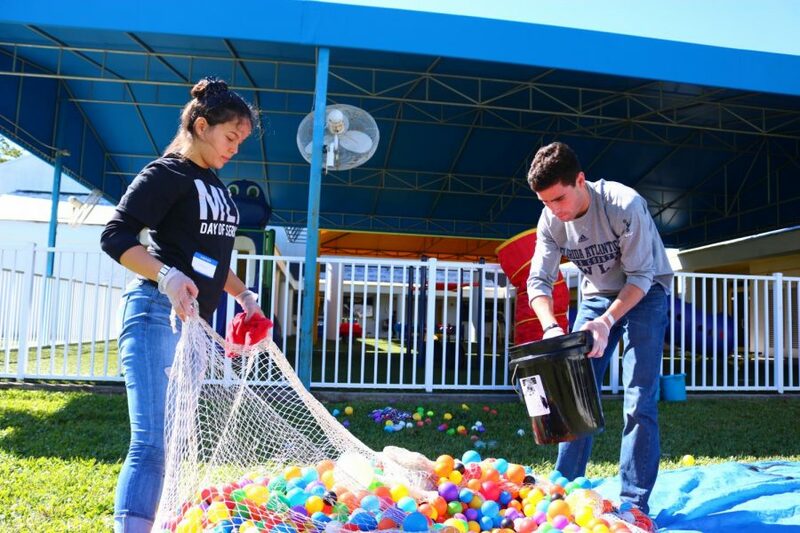 The event was put on by FAU’s Weppner Center for Lead and Service-Learning, and is meant to show students that they can help out with different causes, according to senior education major Kendal Wilson. Wilson is a seasoned volunteer who has been involved with different Day of Service events dating back to his freshman year. He wants to help students discover their passion for service the same way one of his fraternity brothers did for him early in his life, he said. “The goal of Day of Service is to get students introduced to these different social issues and service projects in the hopes that they will come back later on and continue the relationship with an organization,” Wilson said. Day of Service achieved that goal with freshman and Student Government House Rep. Michaelangelo Hamilton, who said he wants to get more involved after his experience. Hamilton has been involved in politics since high school and recently volunteered with Independent candidate Tim Canova’s campaign in Broward for Congress’ House of Representatives, he said. “Activists like Martin Luther King Jr. and Malcolm X dedicated their lives to change. It is important to honor their legacy and it is on us to pave the way to a better future for generations to come. It doesn’t take a large commitment to give back, either. Even doing the little things matter,” Hamilton said. However, some people felt that FAU could be doing more. Senior and education major Josh Stewart agrees that doing something is always better than doing nothing, but believes Day of Service had a small impact and was ultimately frustrated with it. He didn’t understand why the volunteers strictly worked behind the scenes. “We set up the stuff for the kids, but we didn’t actually see them. So, I feel like a lot of people were discouraged,” Stewart said. But either way, community service was definitely important to King Jr. 1968, he delivered a famous sermon in Atlanta, Georgia at the Ebenezer Baptist Church about its significance. “Everybody can be great because everybody can serve. You don’t have to have a college degree to serve. You don’t have to make your subject and your verb agree to serve … You don’t have to know the second theory of thermodynamics in physics to serve. You only need a heart full of grace, a soul generated by love and you can be that servant,” he said. The next Florida Atlantic University Lead and Serve event is WeLead: Diversity Matters Student Leadership Symposium. It’s in the College of Business on Jan. 26, and begins at 8 a.m.
Brad Casson is a contributing writer with the University Press. For information regarding this or other stories, email [email protected].